Situated in the ancient part of Certaldo Alto, the museum opened in 2001 and so it is among the newest in Tuscany. The tour unfolds in some rooms of the ancient religious society premises adjacent to the Augustinian Church of Santi Jacopo e Filippo, where the cenotaph of Giovanni Boccaccio (1313 – 1375), is found. Boccaccio was born in the house that overlooks the same street, a short distance away. 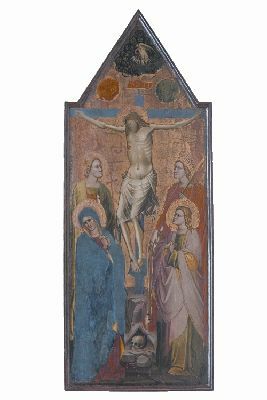 In the museum, there are about one hundred fifty works, coming from various parishes in the surrounding area, such as San Lazzaro in Lucardo, which were brought together here for reasons of conservation and security. 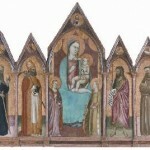 From the church of Santa Maria in Bagnano come three masterpieces of medieval painting; these panels portray the Madonna with Child enthroned, painted by the Master of Bigallo and by Meliore, both active in Florence, the former in the first and the latter in the second half of the 1200’s, and the triptych with the Madonna with Child and Saints Peter and Romolus painted by Ugolino di Nerio about 1320. One of the most important artists of the Florentine Valdelsa at the end of the 1300’s and the beginning of the 1400’s, Cenni di Francesco’s work is present here with an evocative Crucifixion on a panel and by two frescoes taken from the church of San Martino in Maiano, a Madonna with Child and Saint Martin and Saint Catherine, dating back to between 1405 and 1410. 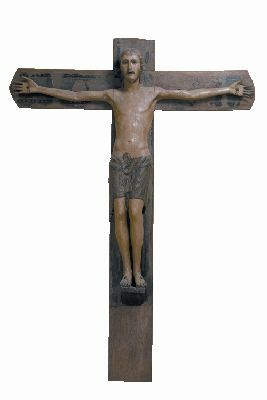 Among the wooden sculptures displayed is a true masterpiece, a surprising Crucifix, sculpted and painted by a Tuscan artist about 1250, which is one of the very rare examples of ‘Christus triumphans’ of the Italian medieval art. 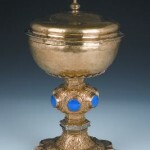 The museum also offers examples of Tuscan painting from the 1600’s and a large collection of vestments, altar cloths and holy vessels, including a reliquary bust in embossed silver of the Blessed Julia, the hermit saint of Valdelsa, who died in Certaldo in 1367 and soon became an object of such strong popular devotion there, that an altar, now missing, was dedicated to her in the Church of Santi Jacopo e Filippo. Il Museo di Arte Sacra a Certaldo. AA.VV., Firenze, Editore: Becocci/Scala, 2001. Size: height 58.5 cm. ; base 14.5 cm. x 14.5 cm. x 9 cm. 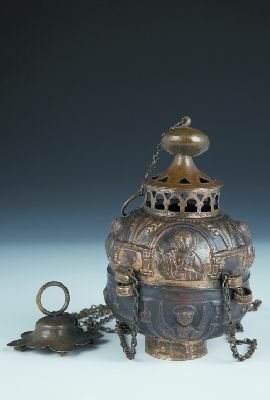 This small sculpture was also originally used as a reliquary as seen by the oval case visible on the front of the base. 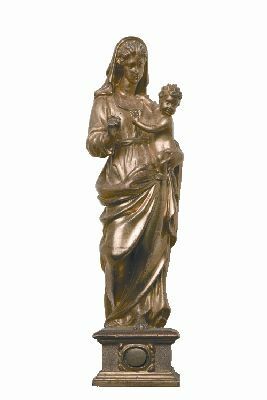 Recently re-gilded, the statuette is characterized above all by the sinuous and graceful position of the Madonna’s body. Even the Child, whose turned head returns the composition to a state of equilibrium, appears delicate and playful. 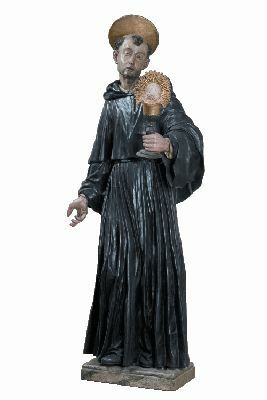 The sculpture depicts an Augustinian saint wearing the black robe of the order with a hood. The iconography shows him with the Holy Sacrament in his hand, to recall his extraordinary devotion to the Eucharist. 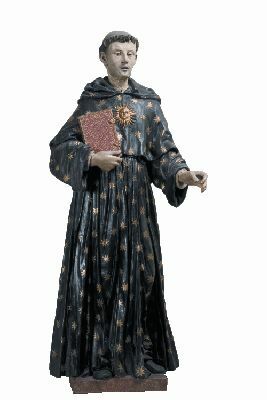 This life-size statue is surprising for the liveliness of the gestures and the ecstatic look, in line with a decidedly Counter-Reformation tone. Size: 44.6 cm. x 23.2 cm. 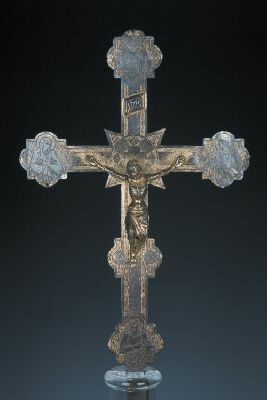 Conceived with the idea of being seen from both sides, this cross shows the archaic image of Christus triumphans on the recto, with the incised figures of the Madonna, Saint John the Evangelist, an angel, and Christ in the sepulcher on the ends. 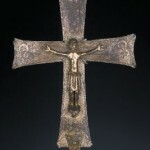 On the verso, there is the figure of the dead Christ in the center and the symbols of the four evangelists at the ends. The attribution to the workshop of Ruggero di Helmershausen is due to Christ’s elementary and monumental anatomy and by his hieratic fixity. Size: 20 cm. x 12 cm. Size: 129 cm x 67.5 cm. 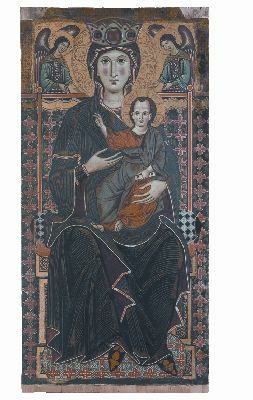 The painting’s rectangular form, from which a fully decorated relief halo extends outward, is completely occupied by the Madonna seated on a wooden throne. She is covered by a blue mantle decorated with three stars alluding to the mystery of Mary’s virginity. In her arms is the Child in the act of blessing. The figures of Saint Lawrence and Saint Margaret are among the earliest examples of the substitution of the traditional angels that flanked the Virgin. The colours are warm and intense, the line relaxed and precise. Size: 214 cm. x 139.5 cm. The uncommon iconography presents, in the upper part, two old men and a woman, who are preparing to perform a circumcision on the Child, and the purchaser who proudly directs his gaze towards the observer. 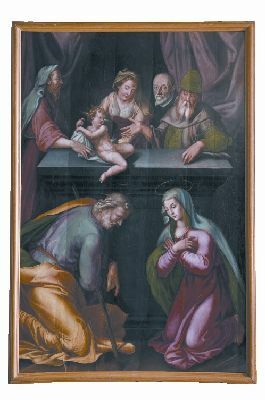 In the lower part, the Virgin and Saint Joseph are portrayed kneeling in adoration of the Son. The painting is characterized by bright, vivid colors. The painting was carried out as an ex devotione of Giovanni Battista Capponi, probably for Neri di Piero Capponi, at the end of the 16th century. Size: 78 cm. x 57 cm. 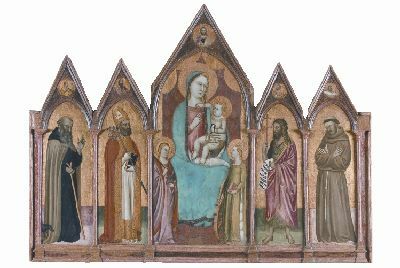 The panel was the central part of a polyptych that originally had the figures of Saints Martin and Anthony the Abbot at the sides. 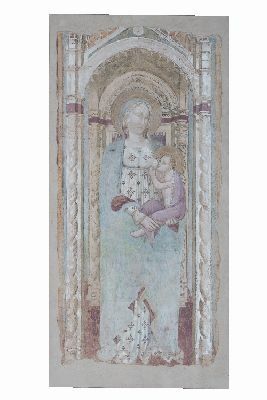 Lippo d’Andrea, an extreme Gothic painter, frescoed the panel with warm and soft colors that help to greatly refine the contained and elegant poses of the divine group. The features of both faces clearly evoke those by Masolino. Size: 69 cm. x 69 cm. 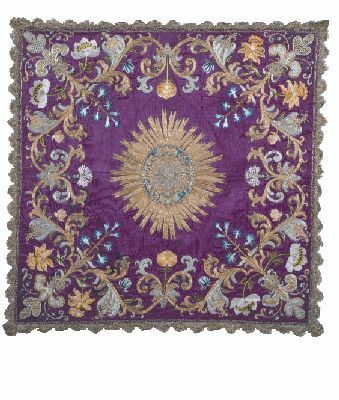 Embroidered in silk, gold and silver on a red background, this chalice veil has the Bernardinian symbol in the center and plant shoots in the four corners that radiate towards the center, inside of which are narcissi, peonies, roses and carnations. The refined article, probably made by the patient hands of nuns, appears to date back to the second quarter of the 18th century. Saint Nicholas is identifiable by the rayed sun in relief on his chest and the gold stars scattered over his robe of the Augustinian order. In his open hand he probably held a lily. This life-size statue is surprising for the liveliness of the gestures and the ecstatic look. Size: 53 cm. x 43 cm. 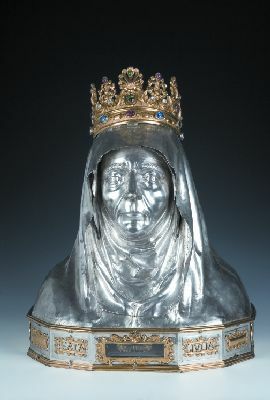 This reliquary bust of Certaldo’s patron saint was commissioned by Domenico Conti, an Augustinian friar from the Santo Spirito convent in Florence. 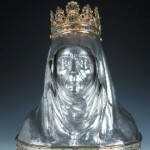 This bust, which displays the relic in the center of the base, is striking for the great characterization of the blessed woman’s face, such that the suspicion was born that the goldsmith had a precise model or perhaps even an ancient image. The gilded crown studded with fake precious stones was added later. Size: 251 cm. x 187 cm. 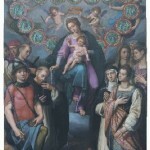 This painting probably is the one commissioned by the Company of the Girdle for the altar of the Blessed Julia in the Church of Santi Jacopo e Filippo. 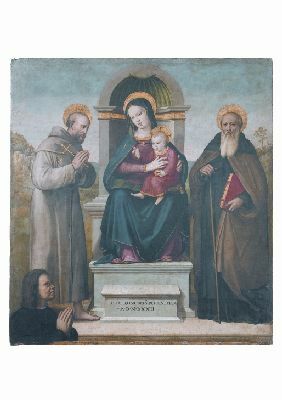 The painting, of a rare iconography, depicts the Virgin of Loreto seated on the holy house supported by little flying angels, while she presents her Child to the Augustinian saints Augustine and Monica. Kneeling are Saint Nicholas of Tolentino, looking towards the Virgin, and the very elegant Saints Ursula and Catherine of Alexandria. Size: 55.5 cm. x 31.8 cm. 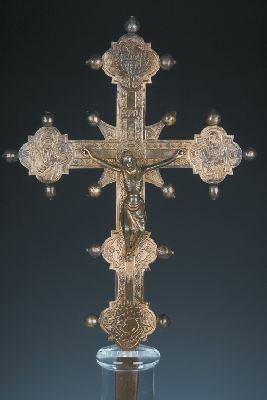 Rather complex, both as regards the technique and the iconography, this splendid cross, extremely well-preserved with all of its ends intact, can be admired from both sides. Similar to another exemplar from the Church of San Jacopo a Mucciana and today preserved in the Museum of Sacred Art in San Casciano in Val di Pesa, it is undoubtedly the result of an artisanal production obviously influenced by the most widespread Florentine figurative models. Size: 40 cm. x 20 cm. 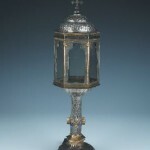 This aedicule-type monstrance rests on a raised triangular foot and has a rounded neck with braided and smooth pod-shaped decorations. The stem has six blue enamel mandorlas, each with a stylized flower. At the top, the small hexagonal aedicule has some openings ending with small charming trefoil arches. A small double cupola with a cross at its summit completes the composition. Size: 220 cm. x 107 cm. 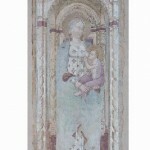 Inside a slender and soaring structure, the fresco depicts the almost diaphanous image of the Virgin while suckling a kicking Child. 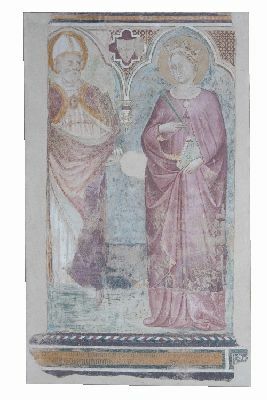 It was part of a single work, together with the figures of Saint Martin and Saint Catherine, which was detached from the Church of San Martino in 1963 for an exhibition in Valdelsa. Size: 118 cm. x 58 cm. This painting, with its monumentality and chromatic richness, bears witness to Meliore’s activity. The Virgin is sitting on a throne covered by precious materials and padded by colored pillows; she wears a large dark blue mantle covered with gilded damask patterns. Besides a halo, the Madonna wears a crown on her head which is decorated with painted precious stones. The Child has a scroll in his hand, a symbol of divine knowledge. Behind them appears a pair of winged angels. Size: 168 cm. x 65.5 cm. 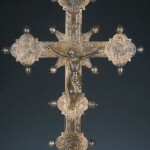 The cuspated panel portrays a sorrowful image of the Crucifixion. 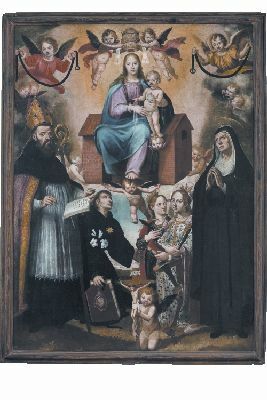 The Virgin and Saint John the Evangelist are in the foreground, while Saint Catherine of Alexandria and a young saint with a cross in his hand, perhaps Saint Miniatus, appear in the middle ground. The supposition for the identification of the latter saint would seem backed by his probable veneration in the Certaldo district. There are various well-known iconographic symbols in the painting: a skull at the foot of the cross, the sun and the moon, and pelican tearing its breast. Size: 240 cm. x 61 cm. The fabric used for this vexillum was made in Florence, as is found in many churches in the town and province. It has a pattern of stylized inflorescences within a mesh of large polylobed leaves. 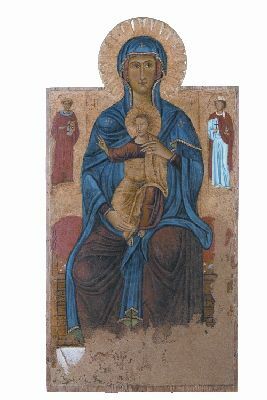 The oval emblem in the centre, on which the Madonna of the Rosary is painted, makes us think it belonged to a confraternity. Size: height 2.2 m. x 2.05 m.
A true unicum in a survey of sculpture, this image of the Christus Triumphans seems to look with wide open eyes at the incorruptible essence of human nature. With its large dimensions, despite its ends having been sawed off, it was described as a roof support, almost as if it were a telamon, in the Church of Petrognano. In a perfect balance between painting and sculpture, the statue of Christ is resting on a cross where a prized pictorial decoration appears. Size: 35 cm. x 30 cm. 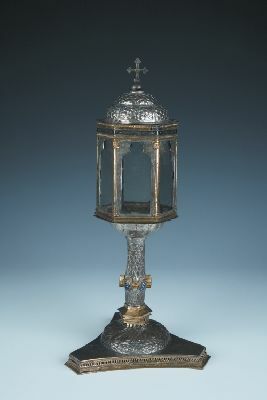 This lamp, as the inscriptions record, was donated in 1736 and is dedicated to the Augustinian Saint Nicholas of Tolentino, to whose order the church where the lamp was found belonged. 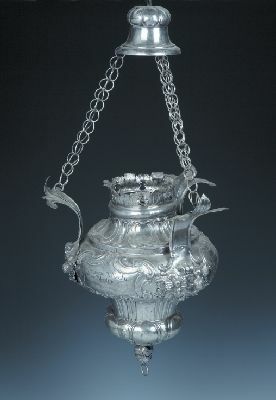 The attribution to the Florentine workshop of the “Spada” was possible thanks to the marks imprinted on two stamps of the lamp. The painting bears the signature of its artist and the date of its execution. 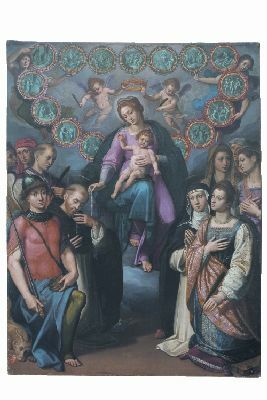 The reference to the purchaser, the Company of the Holy Rosary, is rather explicit in the iconography: the Madonna and Child offers a rosary to a shy Saint Dominic and two angels hold a garland made of fifteen beads, an allusion to the mysteries of the rosary. Notwithstanding the sweet forms and variety of faces and the well-executed anatomies of the characters, the primarily cold chromatic range makes the scene solemn and formal. Size: 51 cm. x 31 cm. 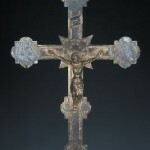 On the recto (front) of this cross, there appears the image of the crucified Christ, with an emaciated and bony body. 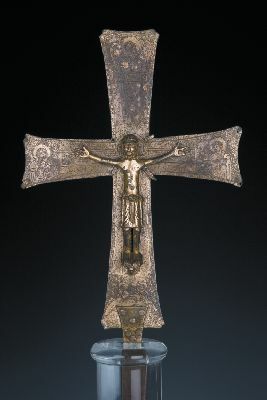 In line with the great diffusion of sorrowful crucifixes during the 14th and 15th centuries, aiming to affect and remind the faithful of the sacrifice of God’s Son on earth, this exemplar also shows a decorative style in the cross’s background both on the recto and on the verso (back). 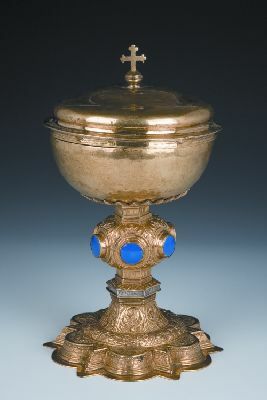 Made in 1496 as a chalice to be donated to the Parish Church of San Lazzaro a Lucardo, it was transformed into a pyx during the 18th century. 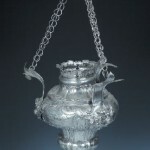 Both the cup and cover, as well as the six gaudy little plates filled with an azure vitreous paste on the node, date to this last intervention. With their harmonious and elegant form the oldest parts, the base and the stem, clearly express the Florentine Renaissance style. Size: 144 cm. x 191 cm. 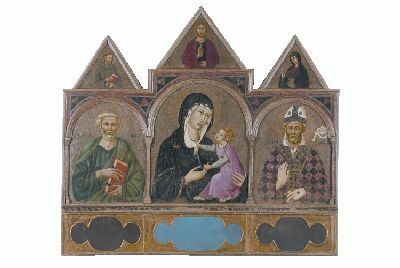 This polyptych belongs to one of the most important painters working in Florence around the 1350’s, Puccio di Simone. A document counts him among “the best painting masters who are in Florence”. 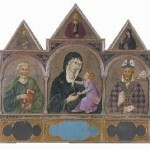 The five cuspated panels depict the Virgin and Child in the centre with Saint Lucy and Saint Catherine of Alexandria at the sides. In the side panels are Saint Anthony the Abbot, Saint Nicholas of Bari, Saint John the Baptist and Saint Francis. Size: 160 cm. x 144.5 cm. On a marble throne, enclosed by a well-defined niche, an affectionate divine group is portrayed. To the sides are Saint Francis and Saint Anthony the Abbot while the half-length image in profile of the purchaser is represented below. The latter was Bartolomeo Dainelli according to the reconstruction of the patronage of the Virgin Mary’s altar in the Church of Santa Maria a Bagnano. 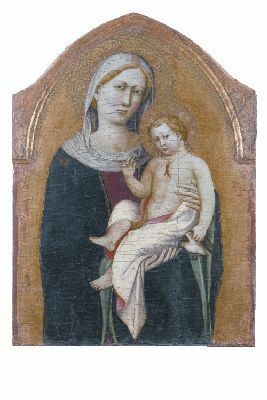 Particularly to be noted are the soft and modulated color passages, and the sweet, delicate forms especially of the faces of the Madonna and the Child. 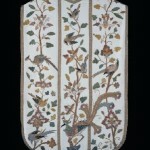 Size: panel: 115 cm. x 155 cm. ; predella: 39 cm. x 115 cm. 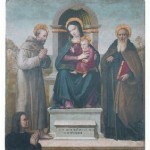 In this graceful triptych, the Madonna is drawn in profile within rounded arches as she exchanges affectionate tender gestures with her Son; to the sides, there appear Saint Peter, with a book and keys in his hands, and Saint Romulus, one of the first evangelists in Tuscany, represented here in bishop’s attire. In the pinnacles are the half-length representations of Saint Francis of Assisi, the benedictory Christ, and Saint Lucy. Size: 114 cm. x 73.5 cm. 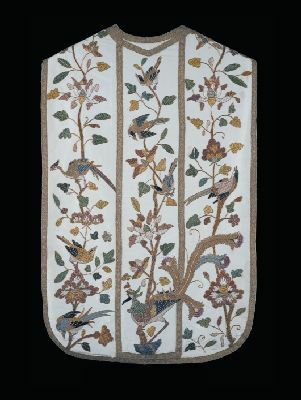 This marvelous chasuble, with an ivory background, is characterized by its multicolored embroideries carried out with the uncommon laid and couched, or Bayeux, stitch technique. Charming birds are set within slender plant motifs, among which is a peacock with its clear and explicit oriental reference. In 1929, it was subjected to a “restoration” by the Florentine nuns of Borgo Ognissanti, who, following a rather widespread practice in the liturgical milieu, carefully transferred the embroideries on to the current background. Size: 220 cm. x 132 cm. ; 220 cm. x 107 cm. The two frescoes were detached in 1963. The current inscription could indicate the purchaser who requested the fresco in order to recommend his own soul to heaven, this being a rather widespread practice throughout the entire Middle Ages. Here, the painter shows an easy decorative style, both in the flamboyant structure that frames the various figures and in the description of their refined and costly robes. Prolific as well as provincial, Cenni di Francesco only rarely went beyond the level of a conventional and uninteresting narrator. Size: 38 cm. x 29 cm. x 7 cm. 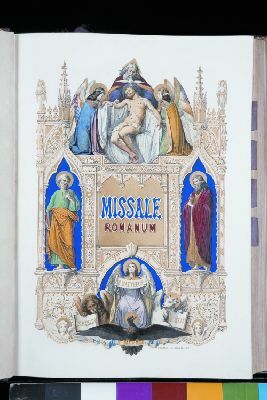 Open to the frontispiece page, this splendid missal was printed in Florence by Aloysii Niccolai in 1862 and was bound by the Florentine bookbindery of Gaetano Tartagli, as indicated by a small card attached to the inside. 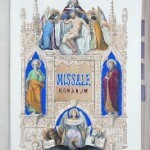 The missal contains seven engravings, all by different artists, portraying the Annunciation, the Nativity, the Adoration of the Magi, the Crucifixion, the Ascension, and the Immaculate Virgin. The vivid and bright colors make the fanciful architectural structure stand out even more. By car: driving along the A1 motorway exit at Firenze Certosa, take the il Raccordo Autostradale Firenze-Siena link road (towards Siena). Exit at S. Donato or Poggibonsi and follow the signs to Certaldo. Tuesday to Sunday: 9.30 a.m. – 1.30 p.m. / 2.40 p.m. – 4.30 p.m. Accessible to the differently abled.